This coming Friday will be my seniors last day submitting articles to our online school newspaper, last day of standing up to present speeches in our public speaking class. It will be the last time they spin that combination to change out one textbook for another, last time rushing from class to bathroom to class again all in under five minutes time. Some of these rituals they will miss. Other routines they will wonder how they managed once they have a few weeks or months perspective on their high school experience. But in addition to the list of lasts, this past year has also been filled with quite a few firsts, for both my students and for me. This was my first year teaching in Michigan. When I started back in September, there were some challenges that I anticipated and some I never saw coming, much like my soon-to-be-graduating seniors. I knew that this year would be markedly different from my previous 13 years of teaching just outside the Philadelphia area. Up until this year, I taught on a four-by-four block schedule with a maximum of 30 students in my classroom. Yes, sometimes 31 or 32 would sneak in, but for the most part, I worked with between 75 - 85 students each semester, approximately 160 each year. This year, I had 137 students first semester, and 131 in my second semester classes. Some of those 268 students I had throughout the entire year, but not all. This has certainly been the largest number of students I have been responsible for in my entire teaching career. And in addition to getting to know more students, I also learned new standards, new state testing procedures, and new curriculum. I taught classes this year that were all new to me. Although I taught a public speaking class about ten years ago, it was nothing like the class I had this past semester. And the tenth grade class I had taught my previous 13 years was focused on world literature. This was my first year teaching tenth grade students American literature. All new content, all new school. New routines, new systems, new faces. I felt like a first year teacher all over again. There were more times that I can count that I ended up crying in my classroom, crying in the car, crying on the shoulder of husband, feeling overwhelmed. How do I both plan and grade? How can I effectively individualize lessons for this many learners? How can I provide timely feedback on this much writing? Then I would catch myself in conversations with students. In the past few months, I have had students miss significant school due to in-patient hospitalizations, homelessness, and parent illness. I have multiple students sitting in my rows who have lost parents and lost loved ones to cancer, to divorce, to accidents, to addictions. I have students who feel bullied and lost and alone. They, too, are overwhelmed. And here's what strikes me: I know these things. I may have more students than I have ever had in my entire career this year, but I also know more students this year. Really know them. The district that I landed in is one that focuses on intervening not just on the academic level, but on the personal level. Each month we meet as an entire staff, the students have a half day of school, and the teachers talk about students. We look at specific students. Why is this student failing my class and not yours? What have you tried that is working? Which students are falling under the radar? Why? Why did this students miss seven days of class in the last month? What's going on at home? We do this each and every month. We connect around the individuals sitting in our classrooms. This is a first for me. 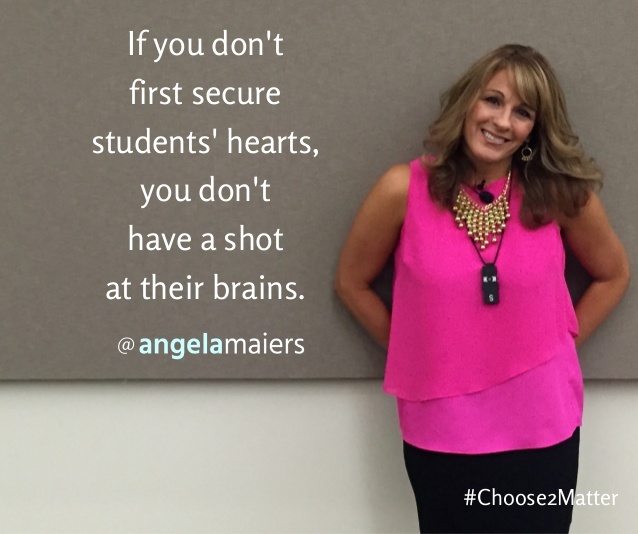 As Angela Maiers wrote not all that long ago, "If you don’t first secure students’ hearts, you don’t have a shot at their brains." The teachers I work with this year care about more than data. During my first year in this district, I have witnessed so many students meet the challenges they are facing head on, both academically and personally. I have witnessed resilience and kindness, empathy and grit. As a first year teacher in this district, students didn't know what to expect from me and neither did I. But I would put forth a challenge, ask them to try a new way of doing something, and students met those challenges and exceeded expectations. In the process, we got to know one another. We grew as a community of learners. And they were not the only ones growing. I had challenging days, challenging weeks. My students would push me. They provided support as well as constructive feedback. About a month ago, I was offered a consulting position which would have taken me out of the classroom. The offer came at a time when I was feeling particularly frustrated, not with students, but with some of the requirements and politics that happen in a public school setting. The consulting position would have paid a little more and put me in closer proximity to my family, but something about it didn't feel quite right. It took some soul searching to figure out exactly what it was. The company is wonderful. Their vision and mission align with my values and teaching philosophy. Their attention to team building, dedicated time for reflection, and commitment to personal and professional development are building blocks for a position made just for me. At the time of the offer, I happened to stumble upon Caitlin Tucker's blog post titled "Manifesting My Perfect Teaching Position" and Vicki Davis's post "When Is It Time To Quit Teaching?" After reading both posts, I realized that although I am frustrated by aspects of my current position, I am not ready for this to be my last year of working directly with students. I love coaching and working with teachers, one look at the list of presentations and conferences I've attended in the past couple years is evidence of that, but I am energized by working with young people. I love teaching emerging writers. I love getting young readers excited about new books. I love connecting practicing readers and writers with real audiences and purposes. I have more to give to the classroom. So this will not be my last year in the classroom. Unlike my senior students, I am not yet ready to graduate high school.